Far-infrared aids in detoxification. This type of therapy may help in fat loss, chronic fatigue, water retention, skin disorders, as well as in the elimination heavy metals, poisons, and carcinogenic material from our bodies. Whenever we process food, and particularly when we have processed unhealthy food or meats, our bodies create lactic acids and release fatty acids, as well as excess sodium and uric acid. With clients who have skin problems, this type of therapy can help cleanse the liver and kidneys, instead of overworking the skin in processing our toxins out through the dermis. Far-infrared therapy very gently increases blood flow by expanding the capillaries that carry blood. It also increases oxygenation and regeneration of the blood, deeply detoxifying it for the improved functioning of all of the major organs in the body that depend on blood for energy. This detoxification is on the deepest level, allowing hidden toxins in the blood and tissue to be dissolved or immobilized. Through subtle heating, far-infrared boosts our immune system, increasing the amount of white blood cells and killer T-cells. It is an excellent therapy for promoting healing, reducing muscle soreness, muscle spasms, and providing relief for rheumatoid arthritis. Research by NASA has shown that far-infrared on the cardiovascular system was a great way of keeping the hearts of astronauts in optimal condition. Far-infrared can also increase the processing enzyme activity in our digestive tract, as well as boost metabolism. 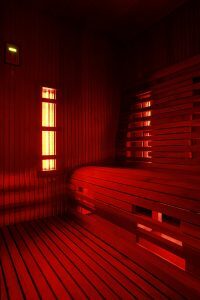 Heart studies done by The Mayo Clinic and the Journal of the American College of Cardiology found that infrared sauna therapy significantly improved blood vessel functioning in patients suffering from high-cholesterol, diabetes, and amongst those who smoke. The therapy also was found to increase circulation, lower blood pressure, lower blood sugar, and help in weight loss.